In the very chic Avenue Foch - once the most expensive street in Paris - I found this weird monument. 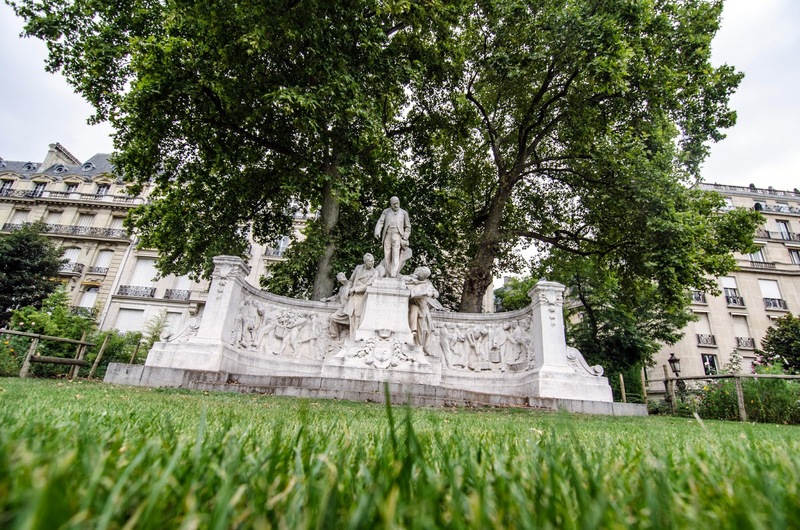 A sculpture made by Aime Jules Dalou, dedicated to Jean-Charles Alphand, a French Engineer who took part in the renovation of Paris under the direction of Baron Haussmann between 1852 and 1870. It was inaugurated in 1899 (December) and shows Alphand (in the middle on the pedestal) and his coworkers Edmond Huet, Joseph Bouvard et le peintre Alfred Roll. Pretty odd! Quite an elaborate sculpture. The curve of it reminds me of a sculpture here on Parliament Hill. It seems his friends admire his shoes. Somewhat unusual --- but I like it. There is certainly no doubt about who is the top man. I wonder if M. Alphond had a hand in the design? All very heroic, they should have swords in their hands and be wearing armour instead of 19th century tailoring.